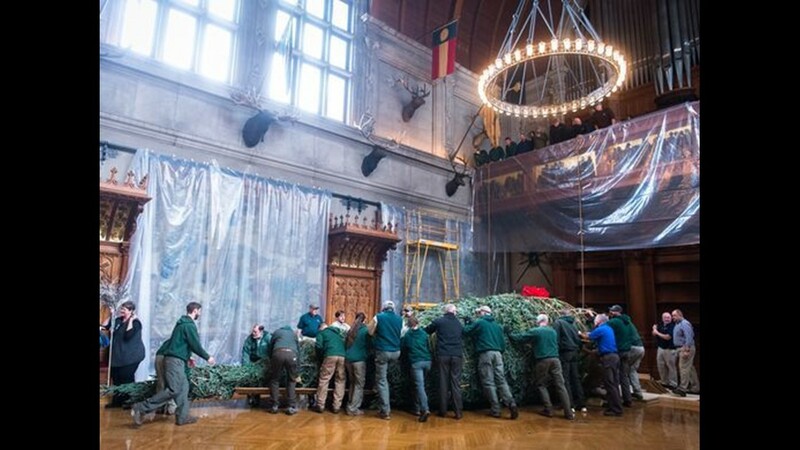 Christmas at Biltmore kicks off at 10 a.m. Nov. 1 when the giant Fraser fir arrives and is raised in the Banquet Hall. 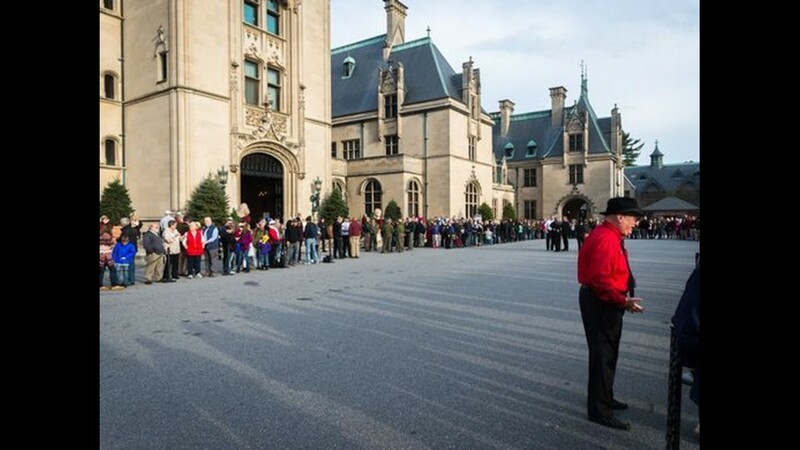 ASHEVILLE, N.C. — Christmas at Biltmore kicks off at 10 a.m. Nov. 1 when the giant Fraser fir arrives and is raised in the Banquet Hall. The official celebration runs Nov. 3-Jan. 6 this year. Learn more at biltmore.com. • 55 decorated trees: For the Christmas at Biltmore 2018 celebration, 55 decorated Christmas trees will reside inside Biltmore House. 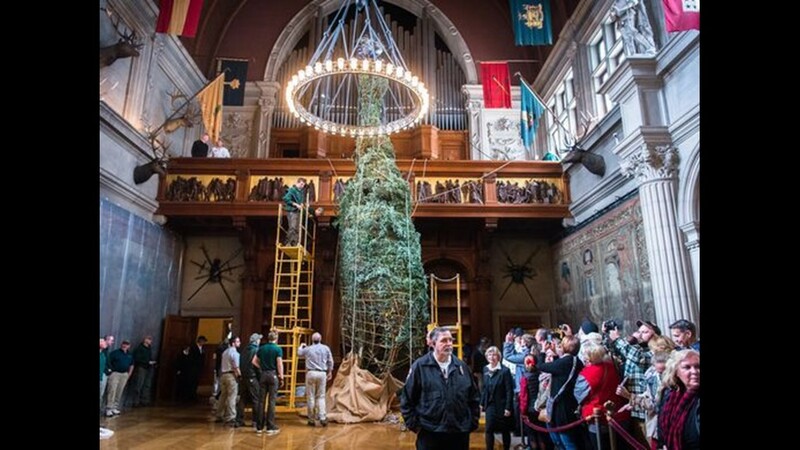 • 35 feet tall: The largest tree inside Biltmore House is in the Vanderbilt tradition — a fresh 35-foot-tall Fraser fir in the Banquet Hall. The smallest is a tabletop tree found in the Raphael bedroom. 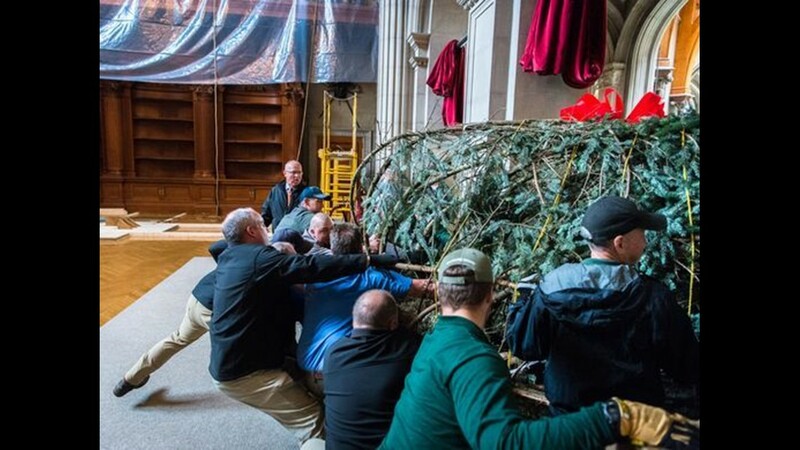 • 50 staffers: It takes around 50 Biltmore staff members to carry in, raise and secure the tree into place in the Banquet Hall. 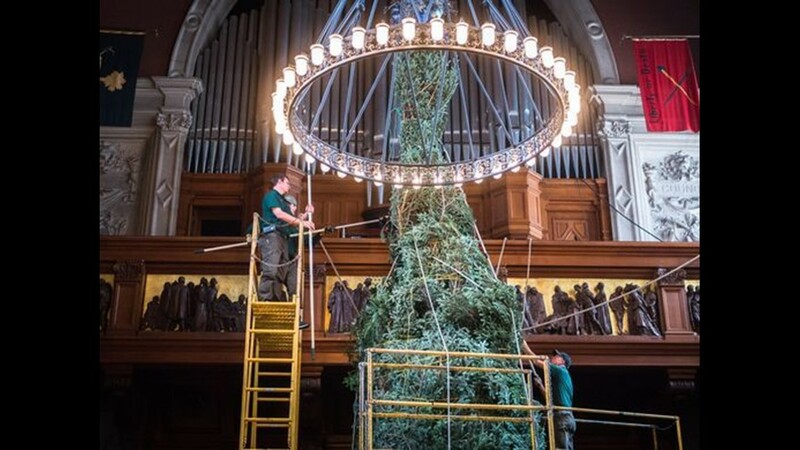 The tree is replaced mid-holiday season to ensure a fresh tree for guests to enjoy and for the safety of the house. • 55 feet tall: A lit 55-foot-tall Norway spruce encircled by 35 other illuminated evergreens decorates the front lawn of Biltmore House for Candlelight Christmas Evenings. • 58 more Christmas trees: A total of 58 additional decorated Christmas trees are at other estate locations, including the Winery, The Inn on Biltmore Estate, Antler Hill Village and our restaurants. • Countless live plants: The Conservatory is decorated with potted plants sitting in tree-shaped planters and other natural materials. More than 30 live trees and shrubs decorate other estate buildings. • 180,000 lights: There are around 45,000 lights and 150 candles inside Biltmore House. Another 135,000 LED and mini lights are found around the estate. • 81,450 lights: 46,000 lights illuminate the Front Lawn tree, with 35,450 more on the surrounding trees and shrubs. “Up” lighting accents the trees lining the front lawn. arriving for Candlelight Christmas Evenings tours. They come back to extinguish them at the end of the night. • 500 each: Five hundred gift boxes, 500 ornaments and 500 LED Edison bulb style electric lights decorate the Banquet Hall Tree. 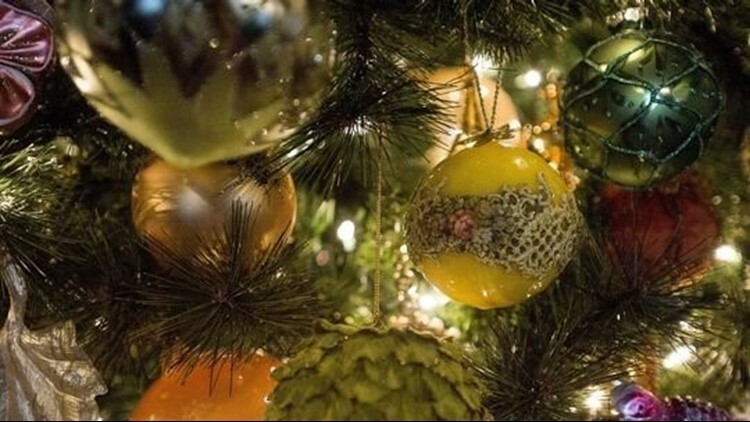 There are 13,000 ornaments used on the other trees inside Biltmore House, and that many again around the estate to add sparkle and seasonal interest. • 1,000+ poinsettias: There are more than 1,000 traditional poinsettias found in the Christmas displays around the estate, along with more than 1,000 amaryllis, Christmas cactus, orchids, peace lilies, cyclamen, begonias, and kalanchoe and potted green plants. There are more than 300 poinsettias just in Biltmore House, which are refreshed and replaced mid-season. 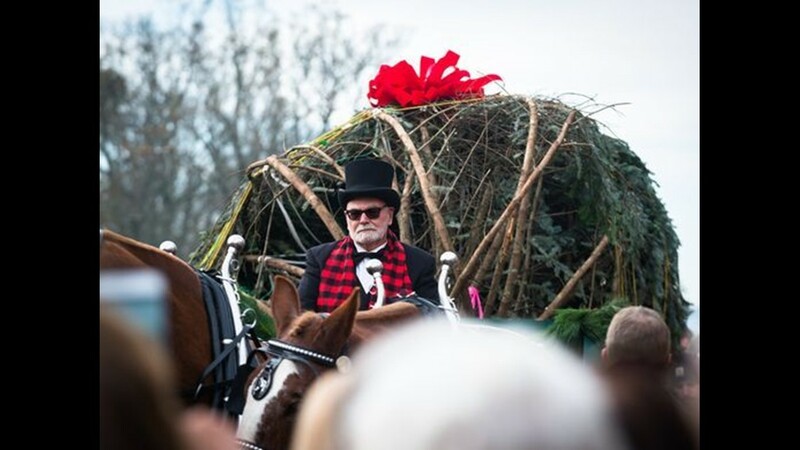 • 490 wreaths: Wreaths are made of fresh white pine and Fraser fir, ornamented with golden arborvitae, holly, or other natural materials such as twigs and cones. Artificial bases are decorated with ornaments, berries, faux flowers and ribbon. 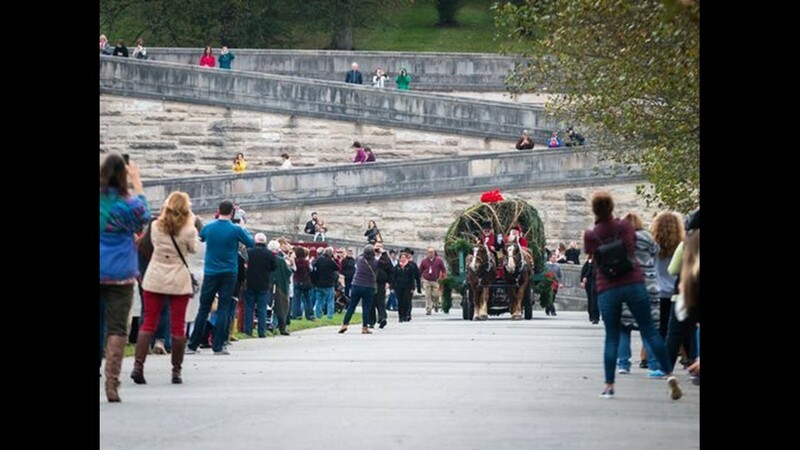 We place 360 fresh wreaths and sprays along with 130 faux pieces around the estate during the season. • 10,227 feet of garland: We use 7,527 feet of fresh evergreen garlanding during the season, made of mixed white pine and Fraser fir. The garlands are replaced weekly to maintain a fresh look and fragrance for our guests. 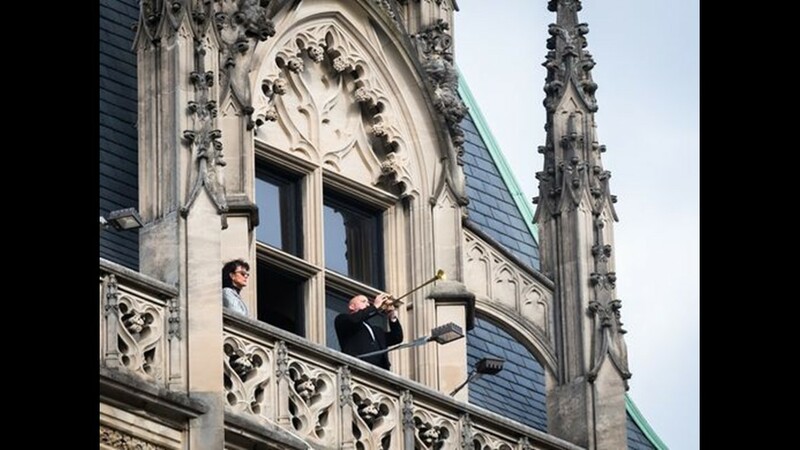 Faux garlands add another 1,200 feet in Biltmore House and around 1,500 feet in other areas. • 1,000 bows. 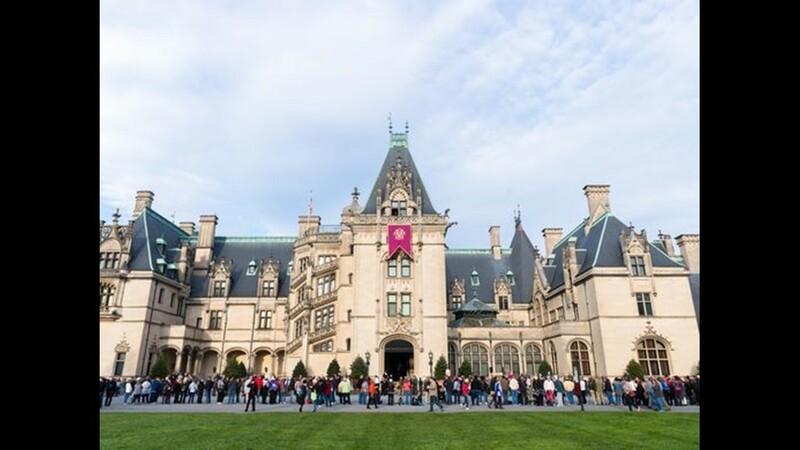 We place 1,000 bows inside Biltmore House with twice as many at the other estate venues. We use everything from narrow cording to 8-inch-wide ribbons to make the bows. We decorate with velvets, metallics, satins, burlap and printed cottons. The amount of ribbon that is needed to make a bow ranges from 5 yards for a bow used on fresh garland on the Grand Staircase, to 15 yards to make a tree topper bow for a 16-foot tree like you might see in the Tapestry Gallery or Banquet Hall. • 16 feet tall. In addition to the large 35-foot tree in the Banquet Hall, there are two 16-foot trees flanking the large triple fireplaces on the opposite side of the room. The design for these trees will feature a series of ribbon swirls using a total of around 1,000 yards of ribbon. • More than 25 decorators. There are 11 full-time floral designers and 14 part-time floral staff members. It takes help from Engineering, Housekeeping, Museum Services, Horticulture, Guest Services, Security, Events, and so many other departments on the estate to that contribute to this annual event.